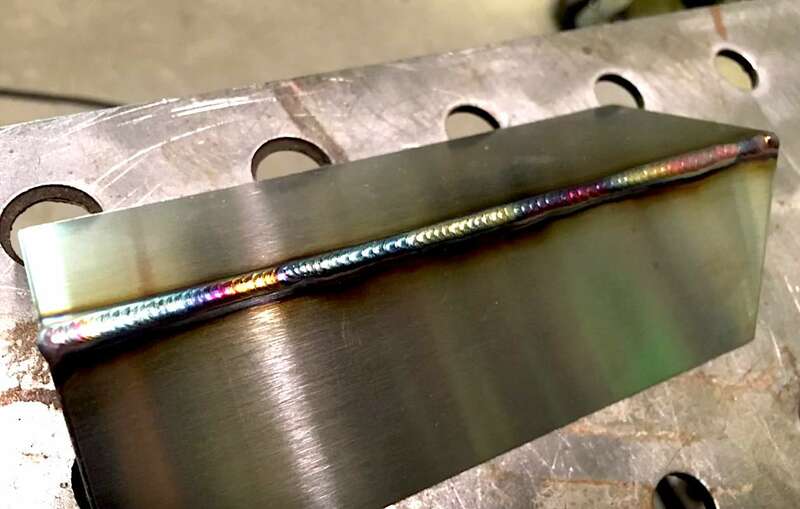 This page is all about TIG welding a Stainless steel outside corner joint on 16 ga. (1.6mm) .063" thick. The outside corner joint is used a lot for stainless kitchen equipment, industrial computer cabinets, tanks, reservoirs, battery boxes, and marine equipment. When a stainless steel joint is welded, in order to preserve the stainless qualities, it is necessary to provide some type of protection on the back side. Argon is best but sometimes it just isnt practical of feasible. Aluminum or copper backing is the next best thing to having argon purge on the back side. but sometimes there is just no substitute for an argon purge. 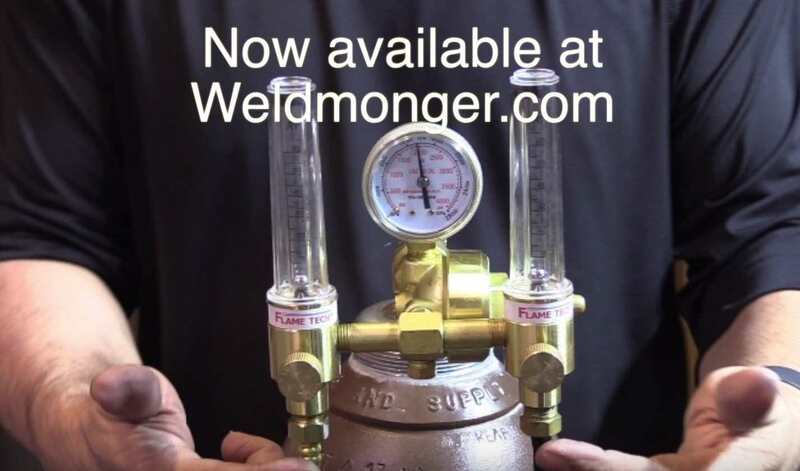 And when you need a purge, the easiest way to do that is with a dual flowmeter. separate grinding wheels and other abrasives too. use only abrasives dedicated to stainless steel. Rod size- as a rule, a smaller filler metal size works better on stainless steel sheet metal welds. one size smaller than what you would normally use on carbon steel welds will work. Amperage for stainless - stainless steel is less thermally conductive than carbon steel and therefore requires only about 2/3 of the amperage that would work on carbon steel. so if you would normally use 60 amps on carbon steel, only 40 amps would be needed on stainless. Get your puddle started quickly and get moving - you should have your puddle in 2 seconds or less and get going. Hanging around for several seconds might indicate a need to increase amperage. What is sugaring/granulation in stainless? 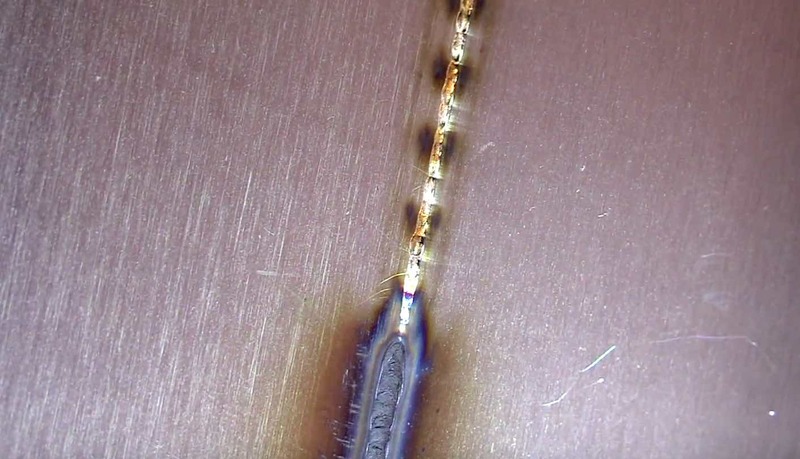 when stainless steel is molten, if not protected by inert gas, the chromium reacts with oxygen and other elements in the atmosphere and what you get is an ugly oxidized rough weld on the back side. And it is not just a surface condition that can be polished off. Sugaring/granulation is a condition that goes deep and unless it is completely removed, it greatly affects corrosion resiistance and it also provides a nest for bacteria and microbes to grow. Imagine a pharmaceutical factory making medications for the elderly and having this condition on the inside of tubing or valves. Or how about a brewery or dairy making edible products with sugaring on the inside of their pipes. Now I am not saying that every stainless steel weld made requires argon purge on the back side. Sometimes using aluminum or copper backing provides sufficient protection. But there are certain applications where argon purging is the only way to get results that are satisfactory for the service requirements of the weld. Nuclear piping, pharmaceutical, food service, semiconductor industries are a few industries that can simply not tolerate sugaring on the root of stainless steel welds.